Buffalo Sabres general manager Tim Murray said that he never saw his team as being a 30th place hockey club when he fired coach Ted Nolan, the guy he decided would take the fall for the debacle that was the 2014-2015 season. No GM ever does see his team as the one landing in last place, but the Sabres did the deed and then some. They finished the regular season with 54 points. The Arizona Coyotes had 56 points to put things in perspective, while even the Edmonton Oilers managed 62 points. Buffalo only scored 153 goals on the season; the Coyotes scored a dozen more. Also, the Sabres were a dismal 9-29-3 on the road. They managed 14 wins at home, three more home wins than the Coyotes. So there’s that. The good news is that you can really only go up from the basement, right? The Sabres could always do worse, but they’ve been approaching the off-season with winning in mind and have made some needed adjustments. Back in May, they announced the hiring of Dan Bylsma as their new head coach. The 2011 Jack Adams winner will have his work cut out for him, but he has the chops to make it happen. Ryan O’Reilly was the big pickup in the off-season for the Sabres and the forward group effectively revolves around him. That’s a good thing. The former Colorado Avalanche centre has no quit button and is good at the minutiae of the game, which means he’s seldom out of position and knows how to produce on the spot. He was good for 55 points last season, including 17 goals. Off-season troubles involving a Tim Hortons and impaired driving could put the damper on things, though. The Sabres also picked up Evander Kane, finally freeing the winger from his untenable position in Winnipeg and giving him a fresh start. The hope is that he makes something of it. There’s no reason not to believe in Kane, who was one of the brightest stars for the Jets up front and has the instincts for the game to make difference-making plays. He had 22 points in 37 games last season and the hope is that the past will be behind him when he kicks off the new year in his new digs. 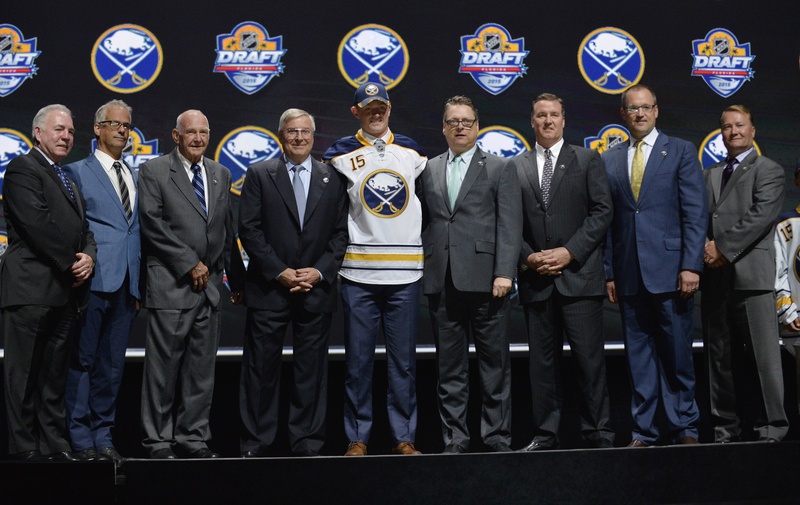 Brian Gionta, Matt Moulson, Marcus Foligno, Zemgus Girgensons, David Legwand, Tyler Ennis, and Jamie McGinn are among those players completing the forward group, but all eyes are on the emergence of Jack Eichel. The second selection in the 2015 NHL Entry Draft signed his entry level deal with the club and seems ready to go, which means he’ll slot in at the number two centre position behind O’Reilly and work his way up. The 18-year-old has huge upside and protects the puck like nobody’s business. If there’s a downside here, it’s that the pressure will be on him from the jump on opening night. It’ll be tempting to judge him on the basis of his first few mistakes, which could give him some jitters. Those will pass over time and the Sabres squad should take shape around their top two centres. It’s no secret that the Sabres have been shopping around for a defenceman. They lost out on the Johnny Oduya sweepstakes, but there’s still time to do a little hunting. Some are suggesting that Cody Franson could be the ideal candidate for the job, but the money might be a little too rich for Buffalo. There are others in the market to work with and it might be in the team’s best interest to be a little tentative with their dollars. Right now, the group is headed off by Zach Bogosian and Rasmus Ristolainen in Ye Olde Depth Chart. Bogosian is another former Jet and a big guy who can captain the rush up ice. He also possesses a hefty shot and can log long minutes. Ristolainen was a top shelf draft pick for the Sabres in 2013 and he’s got serious all-around talent despite a tendency to overdo it. If Bylsma can help contain his more adventurous streaks, the 20-year-old will pan out nicely. Josh Gorges, Mike Weber, Mark Pysyk, Matt Donovan, and even Carlo Colaiacovo flesh out the rest of the group. That’s not a bad unit on paper, especially in the top four, and this could be a really mobile group in the right circumstances. It’s Robin Lehner’s show in Buffalo, whether he likes it or not. The 23-year-old former Senator is ready to be the top banana with Sabres and he possesses the big frame to do so. In 25 games last season, he put up a goals against average of 3.02 and a save percentage of .905 with no shutouts and nine wins. Rebounds are an issue with him, but he manages to keep a cool head and is a sound goalie in terms of his positioning. Chad Johnson slates in as the backup (for now) and that might be a tough sell. The 29-year-old was acquired in 2015 from Long Island and he’s another big goalie, but he’s had trouble finding stability at the NHL level. The Pittsburgh draft pick from 2006 is a long shot to ever play as a starter, but he’s good at getting over nerves and can take over a game if he’s called on. Leaving aside Eichel, the Sabres have a decent pool of prospects to work with. As they rebuild their club, they have an interesting group of centres and goalies to choose from. Russian goalie Andrey Makarov is at the top of some lists and he could provide a solution to the problem between the pipes if his play materializes. He spent 2014-2015 in Rochester and has a year to go on his entry level deal before Buffalo has a decision to make. This could be his year to prove he’s worth a look. Sam Reinhart is slotted in as a fourth line centre on some depth charts and for good reason. The Sabres’ second overall pick from last year’s draft is a skilled playmaker who can slip between the middle and the wing without losing his focus or his game. He has solid positioning skills and does whatever’s asked of him, although he’ll need to find a scoring touch eventually. Nobody said it was going to be easy. The Sabres are in for an interesting year, to say the least. They’ve made some key improvements and are one of the most promising teams in the entire National Hockey League, but there’s a long gap between being a promising team and being a winning team. Right now, that promise is simmering. The Sabres are hoping it boils over. And soon. But this won’t be the year. While it will be fun to watch the arrival of Jack Eichel and the emergence of some other players, the Sabres will still miss the post-season and will still occupy the league’s basement with the usual suspects. They may not finish dead last, however, and that’s something to hang your hat on.